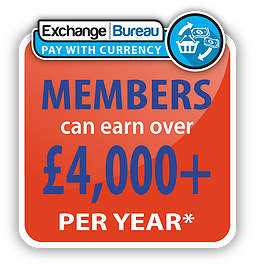 Exchange Bureau PAY WITH CURRENCY user gives you the ability to take currency for goods and/or services you provide, while still being able to give change in pounds sterling. Accept currency notes for your goods and services with our easy to use online system. * On average earnings are based on £1000 (GBP equivalent) weekly PAY WITH CURRENCY transactions (4% profit margin AVERAGE). NEVER LOSE A SALE again when offered Currency Notes as payment from your customers. EARN EXTRA INCOME from every PAY WITH CURRENCY transaction of up to 5%*. GIVE YOUR CUSTOMERS a fantastic service at great rates while also earning extra income. ACCESS through login to your own account with our easy to use transaction template. TRANSACTION HISTORY, is our unique customisable transaction monitoring tool, where you select your monitoring filters, with FULL customer search functionality. EMAIL TRANSACTIONS directly to your customers email address, so you don’t need to print transactions. SMARTPHONE compatible as well as tablet, laptop and desktop computers. ADVERTISING materials available to put in your window to promote your NEW SERVICE. MONITORING of your transactions by our support team to make sure you’re doing things correctly.